Pain in cancer is one of the most common symptoms. It is of vital importance to provide adequate pain relief so that cancer patient can live the last stages of their life comfortable & happily. There are various nerve block techniques used by pain specialist at PCI to achieve this goal. In cases with intractable pain is not responding to simple nerve block, our pain physician treat it by implanting a highly specialized intra spinal drug delivery pump. Our pain physicians are specialized in opioid management for these patients. What causes pain in people with cancer? Pain is most often caused by the cancer itself. But pain can also be caused by the treatment or the tests done to diagnose cancer. You may also have pain that has nothing to do with your cancer or its treatment. Like anyone, you can get headaches, muscle strains, and other aches and pains. Cancer pain can almost always be relieved or lessened. There are many medicines and methods that can be used to control cancer pain. You should expect your health care team to work with you to keep you as comfortable as possible. But no one doctor can know everything about all medical problems, and sometimes pain is a subject they don’t know as much about. Even though a lot of progress has been made, some doctors and nurses do not know the best ways to treat cancer pain. If you are in pain and your doctor has nothing more to offer, ask to see a pain specialist or have your doctor consult with a pain specialist. Controlling your cancer pain is part of your cancer treatment. Your doctor wants and needs to hear about what works for your pain and what does not. Knowing about the pain will help your doctor know more about how the cancer and the treatment are affecting your body. Talking about pain will not distract your doctor from treating the cancer. Pain is best relieved when treated early. You may hear some people refer to this as “staying on top of the pain.” Do not try to hold off as long as possible between doses. Pain may get worse if you wait. Then it may take longer, or you may need larger doses, for your medicine to give you relief. Every patient feels pain in different way. There’s no need to “tough it out” or be “brave” if you seem to have more pain than other people with the same kind of cancer. In fact, as soon as you have any pain you should speak up. Addiction is a common fear of people taking pain medicine. Such fear may even keep people from taking the medicine. Or it may cause family members to encourage you to hold off as long as you can between doses. Addiction is defined as uncontrollable drug craving, seeking, and continued use. When opioids (also known as narcotics) – the strongest pain relievers available – are taken for pain, they rarely cause addiction as defined here. If your opioid requirement goes down, Doctor will give you tapering doses and stop slowly. By the time you stop using it completely, your body has had time to adjust. Some pain medicines can cause you to feel sleepy when you first start taking them. This feeling usually goes away within a few days. Sometimes you become drowsy because now that the pain is under control, you are able to catch up on the much-needed sleep you missed when you were in pain. Side effects from pain medicines can be managed and often even prevented. Some medicines can cause nausea and vomiting, itching, constipation, or drowsiness. A few can cause liver or kidney damage. But some of these problems go away after a few days of taking the medicine. And many side effects can be managed by changing the medicine, the dose, or the times when the medicine is taken. Others, like constipation, can often be prevented with stool softeners and other measures. When a tumor spreads to the spine, it can press on the spinal cord. This is called spinal cord compression. The first sign of compression is usually back and/or neck pain, sometimes with pain, numbness, or weakness in an arm or leg. Coughing, sneezing, or other movements often make it worse.THIS IS RED FLAG SIGN - CONTACT DOCTOR URGENTLY. This compression must be treated quickly to keep you from losing control of your bladder or bowel or being paralyzed. If you are being treated for the compression soon after the pain begins, you can usually avoid serious outcomes such as bladder or bowel problems. Treatments usually involve radiation therapy and steroids to shrink the tumor. Or you may have surgery to remove a tumor that’s pressing on the spine, which may be followed by radiation. This type of pain can happen when cancer spreads to the bones. External radiation may be used to treat the weakened bone. Sometimes a radioactive medicine and Bisphosphonates can help make diseased bones stronger and help keep bones from breaking. These are examples of treatments that are aimed at stopping the cause of the bone pain. You may still need opioids or other pain medicines, but sometimes these treatments can greatly reduce your pain. Some tests used to diagnose cancer and see how well treatment is working are painful. If you and your doctors agree that such a procedure is needed, concern about pain should not keep you from having it done. Any pain you have during and after the procedure can usually be relieved. Your needs and the type of procedure to be done should dictate the kinds of medicine you can get for the pain. You may be told that the pain from the procedure can’t be avoided or that it won’t last long. Even so, you should ask for pain medicine if you need it. Surgery is often used to treat cancers that grow as solid tumors, but other treatments such as radiation or chemotherapy may also be given. Depending on the kind of surgery you have, some amount of pain is usually expected. Doctors prescribe pain medicines so that you don’t have to be in pain when your surgery is over. If you tell your doctor or nurse that you’re hurting after surgery, you can almost always get medicine to treat it right away. Pain due to surgery can last from a few days to a few weeks, depending on the type of surgery. No single pain relief method controls phantom pain in all patients all the time. Many methods have been used to treat this type of pain, including pain medicine, physical therapy, antidepressantmedicines, and transcutaneous electric nerve stimulation (TENS). If you’re having phantom pain, ask your doctor or nurse what can be done. This condition refers to pain, burning, tingling, numbness, weakness, clumsiness, trouble walking, or unusual sensations in the hands and arms or legs and feet. Peripheral neuropathy can be caused by certain types of chemotherapy, though vitamin deficiencies, the cancer, and other problems can also cause it. Be sure and tell your doctor right away if you notice these kinds of problems. Your doctor will want to find out more about what’s causing your pain because that will affect how the pain is treated. 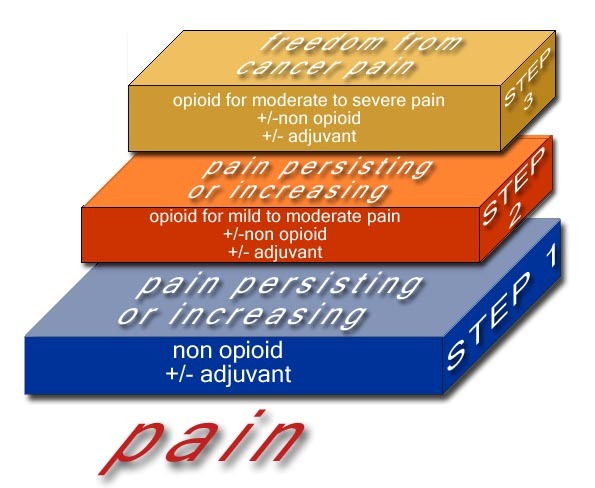 Drugs, procedures, cancer treatments, or even surgeries may be used in special ways to manage your pain.The goal is an effective pain control plan that works for you.For treatment we follow WHO ladder of analgesics. Using a pain scale is helpful in describing how much pain you’re feeling. To use the Pain Intensity Scale below, try to assign a number from 0 to 10 to your pain level. If you have no pain, use a 0. As the numbers get higher, they stand for pain that’s getting worse. A 10 means the worst pain you can imagine. These medicines are used alone or with non-opioids to treat moderate to severe pain. Opioids are much like natural substances (called endorphins) made by the body to control pain. Some work better than others in relieving severe pain. These medicines were once made from the opium poppy, but today many are synthetic, that is, they are made by drug companies. To get good pain relief it should be taken as prescribed and doses should not be omitted thinking that I will take when pain will start. Some of the side effects of opioids are drowsiness, nausea and vomiting and constipation. Usually these reduces in few days after starting opioids. Many different types of medicines can be used along with (or instead of) opioids to help relieve cancer pain. Some of these medicines relieve pain or increase the effect of opioids. Others lessen the side effects of opioids. These drugs are often started at low doses and increased over time. Some people have pain that’s not relieved by drugs or non-medical methods. When this happens, other treatments can often be used to help reduce pain. Pain cannot be felt if the nerve pathways that carry pain impulses or signals to the brain are interrupted. To block these pathways, a neurosurgeon may cut nerves, usually near the spinal cord. When the nerves that relay pain are cut, feelings of pain, pressure, and temperature can no longer be felt – the area becomes numb. Only surgeons with special skills, who are also experts in pain management, should do this kind of surgery. These surgeons normally work with other pain specialists to explore other methods of pain control before they cut nerves – this treatment cannot be reversed. A nerve block is a procedure where a local anesthetic (a numbing drug),often combined with a steroid, is injected into or around a nerve or into the space around the spinal cord to block pain. After the injection, the nerve is no longer able to relay pain so the pain is relieved for some time. For longer-lasting pain relief, phenol or alcohol can be injected. A nerve block may cause muscle paralysis or a loss of all feeling in the affected area. Low doses of pain medicine may be injected into the fluid around the spine (called intrathecal injection). If this works, a tube and a pump may be used to deliver the pain medicine right into the spinal fluid to control the pain. Morphine is often used for this purpose, and you can still have side effects like itching and constipation. Surgery is done to put the small pump and tube into your body. Certain kinds of pain may respond to pain medicine that’s injected into the space around the layers of the spine. If this works, a pump can be implanted so that you can get pain medicines right around the nerves. This may cause numbness or weakness of the treated area. More cancer treatment may be given to shrink the tumor. Sometimes, even when cancer treatment cannot cure the cancer, it can shrink the size of a tumor that’s pressing on nerves and organs and causing pain. Chemo, hormone therapy, or radiation may be used in this way. Radioactive injections are sometimes used when the cancer has spread to many places in the bone – the radioactive drug settles in the bones near the cancer and helps to stop its growth and relieve pain. In a few cases, other treatments like radiofrequency ablation can be used in certain areas of the body. In this treatment, electrodes are put in near the tumor to heat and destroy the cancer. Non-medical treatments are now widely used to help manage cancer pain. Many techniques are used along with pain medicine, though they can also be used alone for mild pain or discomfort. Some people find they can take a lower dose of pain medicine when they also use non-medical treatments. These methods include: relaxation, biofeedback, imagery, distraction, hypnosis, skin stimulation, transcutaneous electric nerve stimulation (TENS), acupuncture, exercise or physical therapy, and emotional support and counseling. "I had cancer of tongue. which was operated and I have taken chemo and radiotherapy. my cancer is healed but I have lot of deformity of the face due to surgery. Now I have pain in the jaw, tongue and face including headache. It was very severe and I could not sleep at night for many months.I was referred to pain clinic by my cancer surgeon. At pain clinic I was re-assured and was started on morphine and other drugs. In few days my pain reduced by 50% and I could eat something. Sleep improved. He adjusted my doses during each visit and this helped me a lot. He said I may need some nerve block but fortunately, drugs did a trick for me and I am better with medical treatment. Thank you Pain clinic for your support."